Our blasting cabinet is made of a stable sheet metal construction and is designed as a stationary unit. On the front side, there is a loading door that can be swung open upwards, which gives access to the entire cabin width. The opening is done by a hand grip and is supported by two gas pressure springs. 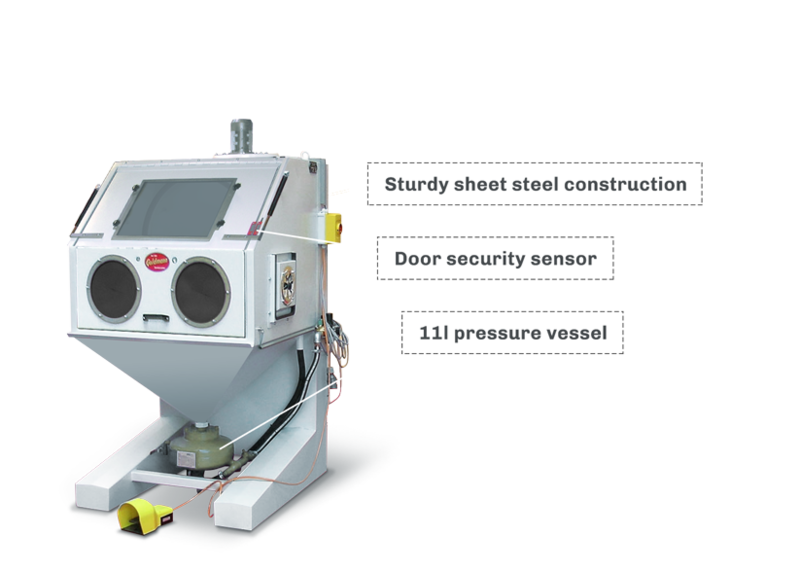 A safety sensor on the door prevents an unintended start of the sandblast, when the door is open. The front door is equipped with a large, easily replaceable viewing window, 400 x 500 mm, as well as two large access openings, 300 mm in diameter, with rubber sealings. If desired, the openings can be fitted with fixed gloves. At the same time, the cabinet is illuminated with a powerful lighting, which is mounted on the roof and therefore free of wear. Inside, the cabinet is lined with light anti-abrasive protection material on three sides for wear and noise protection reasons. The work grate is made of solid, perforated sheet steel. 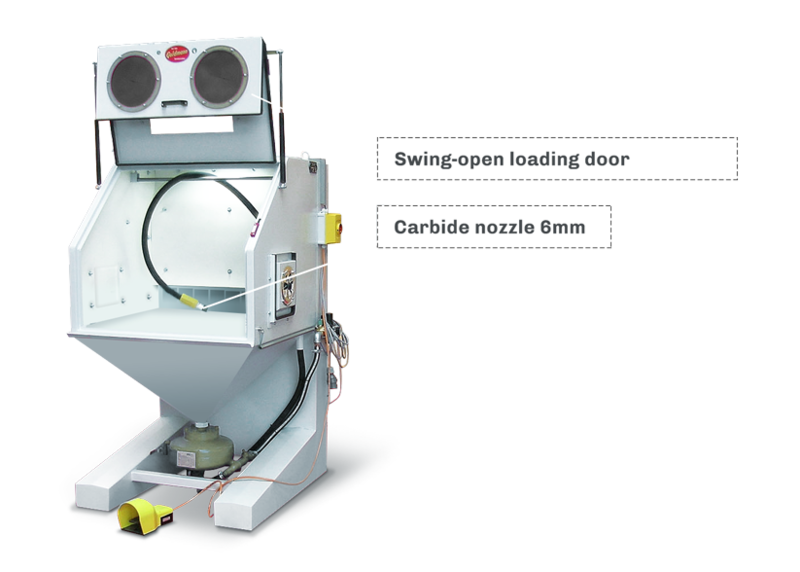 Below, there is the blasting material collection hopper, among which the pressure blasting pot with 11 l content is set up. This pressure blasting pot is approved for an operating pressure of up to 6 bars and is equipped with an air relief valve and a check valve. By using an adjustable abrasive mixing valve, a precise, continuous regulation of the blasting material quantity, according to the required conditions, is possible. The nozzle, which serves as a high-performance nozzle, is equipped with a tungsten carbide insert. 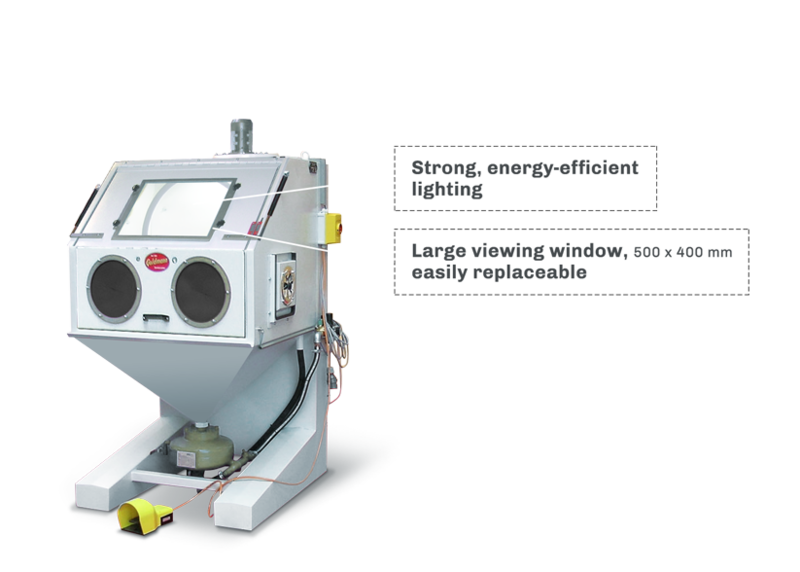 The service life of the sandblast nozzle is about 800 – 1.000 operating hours, when using glass beads. With a 6 mm blasting nozzle and an operating pressure of 2 – 6 bars, the air consumption is between 1.000 – 2.330 l/min. 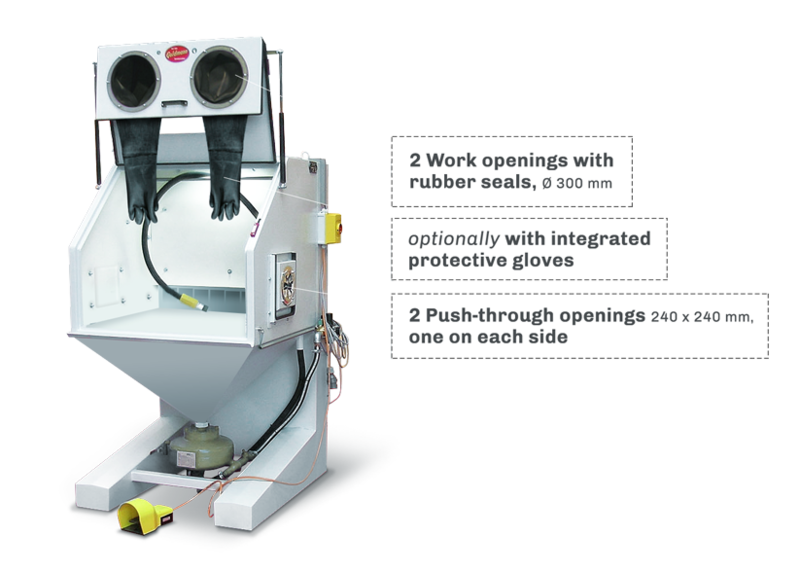 The cabinet is equipped with a corresponding dust extraction with ventilator, which is mounted on the back of the cabinet. The filtering is done by a large filter cartridge with a filter surface of 14 m². The separated dust is disposed via dust collecting bags. 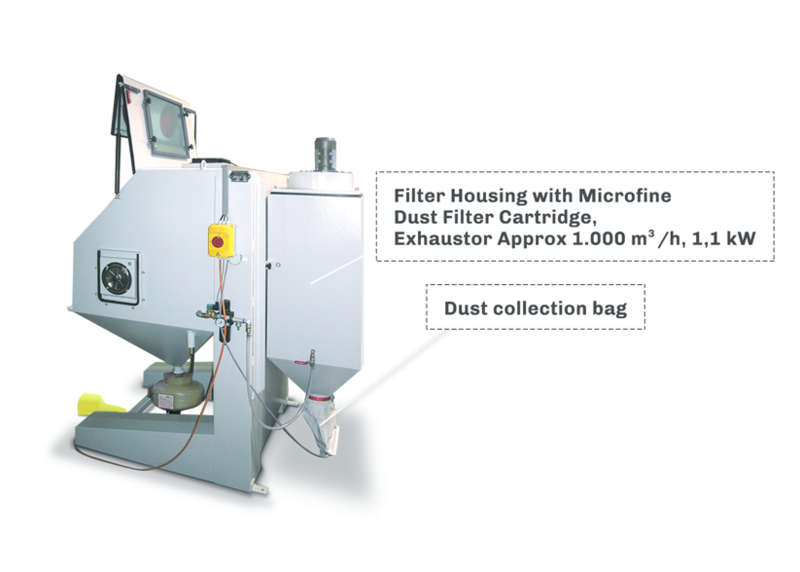 Inside the blasting cabinet there is a separator in front of the suction piece of the dust extraction and laterally, there are two shut-off valves that allow an air supply regulation. After pushing up the shut-off valves, there are two push-through openings, 240 x 240 mm, for long material. On the right side of the cabinet is the on/ off switch for the ventilator and for the lighting. Furthermore, the switch board is equipped with a cable and a foot switch, in safety execution, for activating the sandblast. An oil and water separator with pressure regulator and manometer, as well as two lifting brackets, round off the complete equipment of this high-quality, but still favorable blasting cabinet “made in Germany”. The high efficiency and engineering superiority of our cabinets should also convince you – especially for your way of working. For a blasting test and further information, we are gladly at your disposal.